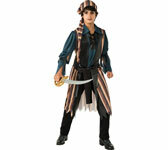 Charming Boy Pirate Captain costume. This beautifully designed costume includes: Shirt with attached vest, waist sash, headscarf. Size: MEDIUM (size: 8-10, approximately 5-7 year olds). Accessories: Sword, makeup, pants and shoes not included. They are available on our website.